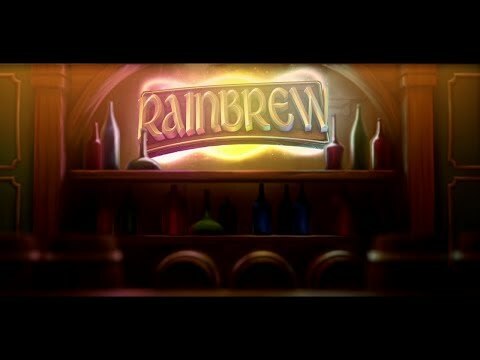 The Rainbrew slot was developed by Just For The Win and released by Microgaming. It is set in the magic brewery of a Leprechaun and has a unique gaming area with two additional rows where special symbols appear to boost winnings. There are 5 reels, 243, 576 or 1,125 ways to create winning combinations, 3 different wild symbols, a round of free spins and expanding wilds. The free spin symbol is the logo of the game and it only appears on the 2nd and 4th reels. When 2 appear on both reels, they will activate both horizontal reels which will spin with additional free spin symbols. If 3 free spin symbols appear you will receive 6 free spins and 4 will trigger a round of 10 free spins. During the round both horizontal reels are active and the number of ways to create winning combos increases to 1,125. In the special horizontal reels only regular Wild and Free Spin symbols will appear. If regular wilds appear in both horizontal reels on the same vertical reel they will extend to create a wild reel. Every time a free spin symbol lands, an additional free spin will be added to those that remain. Discover a whole variety of free play online slots that feature free spins at Neonslots.com. Above and below the playing area you will see two tubes that act as additional rows. The top one is filled with blue liquid and the bottom one contains green liquid. Both of these rows will contain additional wild or free spin symbols depending on how they were activated. If one is active the ways to win increases to 576 and if both are active then there will be 1,125 ways to create winning combinations. To trigger these rows special wilds need to land. The Top Wild symbol will only appear on the 2nd reel and in the bottom special reel. The Bottom Wild can only land on the 4th reel and in the top special reel. If the top wild symbol lands it will activate the special top row and if the bottom wild symbol appears then the bottom special row will activate. Once activated, additional wilds will appear in these rows giving the potential to increase the chances of creating winning combinations. The logo of the game is the free spins symbol which activates the horizontal reels and round of free spins. It is extremely easy to control this leprechaun game, as it has been optimised for players who like to use their mobile phone, tablets, iPads or iPhones to play online slots. To set the bet, click on the button that looks like a casino chip and choose the bet value. The large green button with an arrow on it will spin the reels once, however if you wish to set a round of up to 100 autospins then use the smaller button that has two arrows on it. The button that has 3 dots on it opens the advanced game settings where you can switch on or off the game sounds, open the paytable and activate quick spins. At the bottom of the screen you can see your bet amount and balance. Find more online slots that feature Leprechauns and treasure and are free to play at Neonslots.com.